Tony Krezel wanted a "car-replacing" bike with a belt drive and a gearbox that he could ride year-round to his job at a medical laboratory in Salt Lake City. He hired SaltAir Cycles to build it, and the result is a colorful, innovative and award-winning commuter bike. The SaltAir, pictured above and below, is among the cool belted bikes displayed at the 2018 North American Handmade Bike Show. In our last post we showed the belted mountain bikes of NAHBS. Today we show the most eye-catching urban, touring, tandem and cyclocross bikes. First up is the SaltAir, built by framebuilder Matthew Nelson. This workhorse features a Pinion C1.12 12-speed gearbox integrated with the new brake lever shifters from Cinq 5. 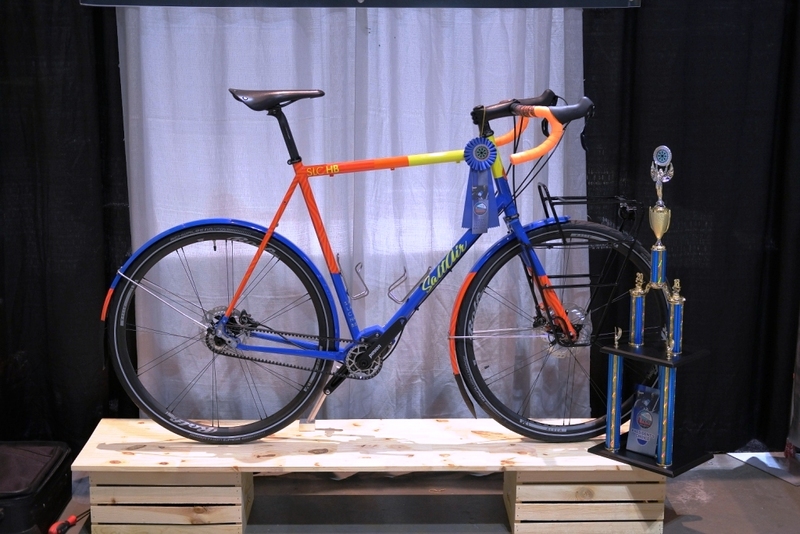 The dazzling paint job and technology caught the attention of NAHBS judges, who gave SaltAir Cycles the President’s Choice award and a blue ribbon for Best City/Utility bike. SaltAir won the President’s Choice award at NAHBS. Co-Motion Cycles showed multiple bikes with Gates Carbon Drive, including this powder blue Americano with a Pinion gearbox and Gates belt. Gates is the North American sales and service partner for Pinion, and Co-Motion is among the US brands embracing this sealed and low-maintenance shifting system. With plenty of braze-ons for racks and panniers, this Americano is ready for the open road. Co-Motion also showed a Java tandem with double Gates drives. In addition to the primary drive that connects to a durable Rohloff Speedhub in the rear, the Java also uses the new 11-millimeter tandem timing belt. Gates tandem belts save a large amount of weight compared to long timing chains. With its double-belted drive, rugged tires and sturdy tubing, the Java is a tandem built for adventure. The Klatch, below, is Co-Motion’s gravel bike, equipped with a gearbox and belt, a Lauf fork to soften rough dirt roads, plus disc brakes and room for 40-millimeter off-road tires. The wine-dark powdercoat is pure eye candy. REN is the sister brand of Portland’s Ti-Cycles. Below is their Ivan SSCX race bike, equipped with HiFi wheels, a T47BB, and a PDXTI Rockerbone tensioner. Plus, says REN’s Eric Herboth, “the exclusive REN rocker inserts provide the only 142 x 12 thru-axle setup on the market with the ability to run a 140-millimeter rear rotor.” Yessir. And the etched and anodized frame graphics provide extra bling. The Rockerbone enables easy tensioning on Rocker-style dropouts. Bilenky Cycle Works showed an urban utility bike with a stylish Brooks saddle bag. Stephen Bilenky is an industry legend, and his company does original builds as well as belt drive retrofits. Fifield is a custom eBike brand from Massachusetts whose frames are welded by another industry icon, Ted Wojcik. More electric bikes are showing up at NAHBS every year since Gates sponsored the first electric bike showcase at NAHBS 2014. And that’s a wrap from Hartford, Connecticut. Thanks to Gates engineer/photographer Tim Lucking for the artsy photos. See you next year at NAHBS 2019 in Sacramento, California. Until then, enjoy more NAHBS photos from years past on the Belted Blog.